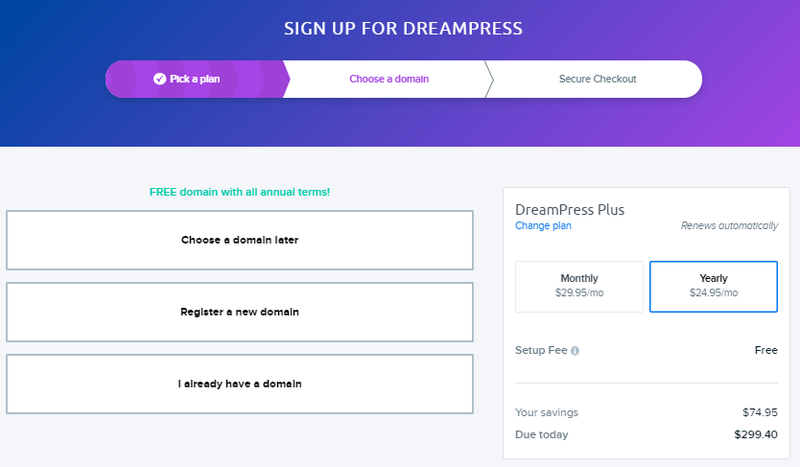 This article explains how to sign up for a new DreamPress hosting plan. This article is for new customers that wish to open an account with their own personal details and payment information. After you've decided on the plan, click the 'Get DreamPress' button under it to proceed with account creation. After you've selected a plan you can proceed with creating your account. When you've decided on the plan you'd like to purchase, click the button under it to proceed. After clicking the button, you're taken to panel.dreamhost.com/signup. Here you can enter a domain to purchase, transfer an existing domain, or click 'I'll choose a domain later' to skip the domain part. To the right, select the payment plan. Enter your credit card details on the next page. WordPress Migration Service: Select this option to have DreamHost migrate your WordPress site for you. Install WooCommerce: This adds the free WooCommerce plugin to your site so you can set up an online store. When finished, click the Submit Order button at the bottom of the page.